'Tis almost the season for gifting and celebrating the people we love, Summer, summer fruits, summer fruit-themed drinks (ahem, frose...hello), and all that good stuff the end of the year seems to symbolise. I pride myself on my gift-giving and I'm not ashamed to admit that, however egotistical of me that may be. I do find book gifting a bit trickier but that's probably just because I am so biased and I know it. That being said, these are all books I've read in the last year or so and loved. They're all under $25 and would make perfect stocking stuffers for yourself, if you want to quite literally, treat yo'shelves or for the people in your life. Books and chocolate or books and wine or books and...whatever they fancy to accompany books. You cannot really go wrong. devotion x patti smith: My love for Patti Smith's writing knows no bounds. She just does it so wonderfully and really evokes all I love about the nuances of day-to-day-life. The smaller details, the beauty that is art and artists and love and life. Devotion is her response to the question posed to Windham-Campbell prize recipients, that being why they write. Buy it, underline it, slip it into your pocket and wander the streets with a coffee. what would the spice girls do x lauren bravo: Say the words 'Spice Girls' to me and my mind instantly becomes a nostalgic, glittery, translucent accessory, yelling lyrics and "peace+pout" kind of zone. I still remember how fancy I felt with my Spice Girls Impulse spray, though I am not quite sure how I managed to wrangle that one. And not a day goes by that I don't regret getting rid of my photo collection and Spice magazines among other things. Hoarder? Pfft. Anyway, if the Spice Girls and feminism, and growing up as a woman in the years since they arrived on the scene appeals, get this. It'll make you laugh, it'll make you smile. It'll have you opening up Spice World and trying to not lip-sync along on the train. The latter definitely didn't happen, I don't know what I'm saying ahem... I loved this book so much. It's a good time. poukahangatus x tayi tibble: Poetry is a bit more subjective but I don't know anyone who hasn't read this debut collection and not connected with it. Tayi Tibble is a force to be reckoned with and I love how she effortlessly combines pop culture with her heritage and experiences growing up. I also read and loved Hera Lindsay Bird's latest book, Pamper Me to Hell & Back as well as Indy Yelich's debut Sticky Notes. Both also by New Zealand women which I'd recommend as well for gifts. 300 arguments x sarah manguso: I was talking about this book the other day with someone and I think my enthusiasm alone was enough to convince them to go out and look for it. 300 Arguments is quite simply a spontaneous flow of ideas that read like a diary. It's a very powerful book and I found it a really clever way of writing. So much that I try to have writing sessions where I just write whatever ideas come into my head down. I don't necessarily always find nuggets of wisdom but it's a really fascinating way of writing. I'd recommend this if you like reading autobiographical essays but also books that play with the non-linear structure. the clothing of books x jhumpa lahiri: One for the book enthusiasts out there. An essay that looks at the way in which readers and authors connect with books and their design. It's well considered and evocative. ariel x sylvia plath: After The Bell Jar I feel like Ariel is probably the next most recognisable Plath title. Whether she drew inspiration from the fairy-like character in Shakespeare's The Tempest is up for debate but it's such a poignant volume. Her writing is just beautiful. I'll leave you with this line from Words; "From the bottom of the pool, fixed stars / Govern a life." 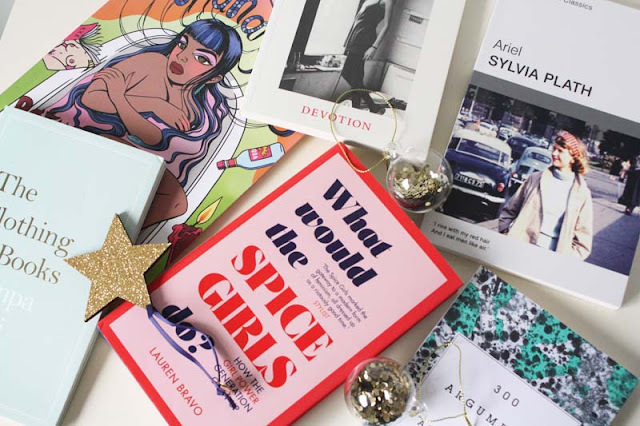 -What books would you gift in 2018? A Star Is Born: So I feel like I'm well behind everyone else when it comes to watching this film. Aka, the one with Lady Gaga and Bradley Cooper. I'm sure everything that needs to be said about this film has been covered now but it is brilliant. I laughed at the dark wit, I cried-oh how I cried, I grinned like a frickin cheshire cat whenever Ally and Jackson took the stage and played to the masses. It goes without saying that Bradley Cooper is some kind of wizard and it's evident here. The main star though is undoubtedly Lady Gaga. She absolutely kills it in this film. I was blown away by her talent and brilliance. Also this song is everything. Crystal Clear: I'm not sure what it is about clear accessories that seems to appeal to me. It could be the nostalgic quality, reminding me of clear, glittery jelly sandals. Perhaps it also appeals to my inner nosy parker. Anyway, when I saw the newest Deadly Ponies collection, my eyes turned heart-eyed. My favourite is the Mr Stitcher. I love the unique shape and handle as well but I think this bag would be so cute for Summer. You're Booked: Maybe I'm missing something but I feel like strictly book podcasts aren't really a thing. Please correct me if I am wrong. So when Daisy Buchanan announced her new podcast, taking a look at the shelves and books in some of Britain's writerly homes, I was stoked. Her first guest was Dolly Alderton so naturally it is a good 'un. Go give it a listen and subscribe here. Slides: Back in the day when I used to straighten my hair within an inch of its life, I loved me some embellished bobby pins. Anyway this year I've been on the lookout for more because I like to channel Blair Waldorf sometimes, you feel me? They remind me of Dodie Clark too-not a bad thing by any means. 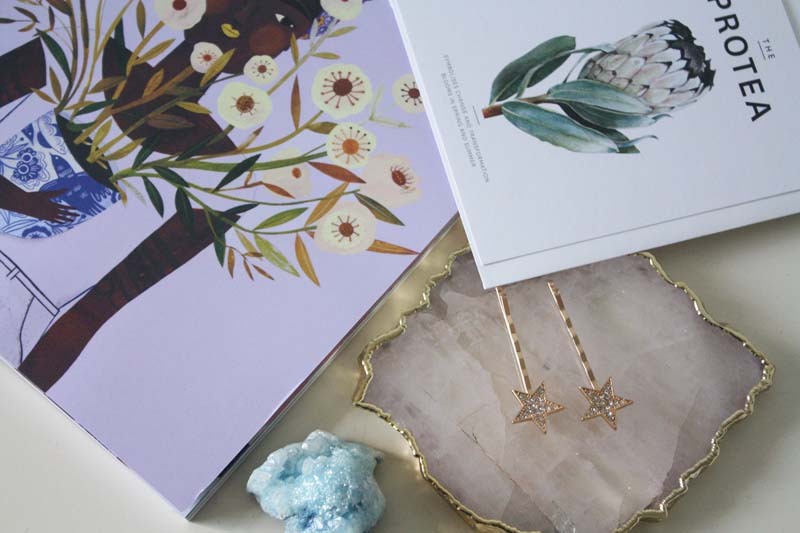 Anyway, I found these starry gems (see above) as well as some pearl ones at Colette x Colette Hayman and my hair accessorising dreams came true. I can't see these styles online but they were cheap as chips so I recommend heading there if you're after some bobby pins. -What's on your radar in November? normal people* x sally rooney: This. Book. Though. I know it's everywhere and it's getting a lot of praise but it's valid. Normal People is the story of Connell and Marianne, two teenagers who come from very different worlds. Marianne is well-off yet alienated and Connell comes from an underprivileged background, yet is well-liked and respected by his peers. We follow them from high school through to their early twenties as they navigate adulthood and university. Normal People contained some aspects which really resonated with me personally and I guess subsequently I feel more enthusiastic about this novel as a result. Sally Rooney really finetunes her characters like nobody else and I'm rather obsessed with the way she develops her characters throughout her novels. It's so brilliantly done. I highly recommend this book-I cannot stop thinking about it and I kinda regret lending my copy out because I already want to revisit it. sweetener x ariana grande: I'm sure this inclusion will perhaps raise some eyebrows but y'know what, I spent too long listening to music I didn't actually like and now I just embrace what I like to listen to. Life is so much better #sophiesrevelations. In seriousness, this album is a bop and I love it. It's my car soundtrack, commute soundtrack, applying makeup soundtrack. I listen to it a lot ok. Side note: thank u next is an anthem. Anyway, sweetener is a good time and I'll probably have it on high rotation for a while. stila magnificent metals liquid eyeshadows: These eyeshadows have made their way into a few favourites posts now so I will keep this brief. Liquid, glittery goodness that lasts and looks stunning. I always receive compliments when I wear these. I'm not gonna lie-they're a bit of a mood raiser. Glitter eyeshadow just makes my heart happy y'know. 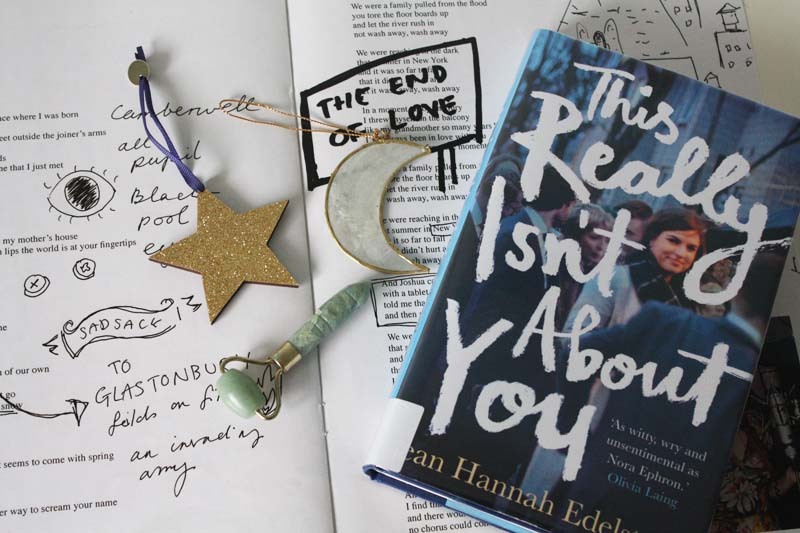 this really isn't about you x jean hannah edelstein: I love personal essays so much and whilst I'm still reading this volume, I had to include it here. I love books like this that I am able to immerse myself in and zone out. Free from the distractions of the world. Actually I just love reading as escapism in general but more on that another time. Anyway, if you like biographical essays as much as I do, get ahold of this. yu ling roller: It was this blog post by Tara that reminded me I had a jade roller I'd shoved to the side of my bathroom cabinet. It's now become one of my favourite things. One-It's a massage for my face and after a hectic day, I am all about that unwinding time. I also love using it to apply serums as well. -What have you loved recently?